Are You Multitask? For Real? The news that multitasking is bad isn't even news anymore. In recent years, people have begun to recognize what psychologists have known for decades: If you try to do two things at the same time, you'll likely get worse at both of them. We suggest this reading if you want to know how our brain works. Um escova inteligente que te indica produtos específicos para o seu cabelo, ajudando na sua necessidade? Sim, e ela está sendo desenvolvida pela L’oreal. A escova chamada de “Kerastase Hair Coach Powered” tem a forma de uma escova comum de cabelo, mas a tecnologia embarcada nela é interessante. Microfones gravam o som da escovação para poder detectar se os cabelos estão secos, ressecados, oleosos ou fragilizados e com tendência a queda por causa da quebra. Ela ainda possui um giroscópio e um sensor acelerômetro que faz uma média de quantos escovadas a pessoa deu nas madeixas. Até mesmo a pressão e força que faz é registrada. Todas as informações coletadas são transferidas e sincronizadas para um app no smartphone, mostrando a situação dos fios e assim, sugere os produtos para os problemas encontrados. Você acha que isso é exagero ou poderá ajudar pessoas que sofrem com suas madeixas? Você teria uma escova dessa? Existem outros produtos similares? Last year at Paris Fashion Week the tech was there, with the clothes. The Cypriot-British designer has long experimented with the relationship between his garments and the role technology can play. He has introduced looks that changed shape thanks to microchips and animatronics, dresses embedded with 15,000 LEDs to recreate a pixelated screen and even a coffee table that turned into a skirt. “Only with technology can you create new things in fashion. Everything else has been done,” he has previously said. Is this the future? If you want to know the process, read this Forbes’ article. O artigo da hypeness conta que uma startup criou a solução para quem tem preguiça de arrumar a cama de manhã. Um cobertor inflável é colocado junto dos lençóis e edredons e, ao se encher de ar, deixa tudo esticadinho e no lugar certo. Um aplicativo conectado ao cobertor permite agendar seu funcionamento, variando os horários a cada dia. Você teria esse aplicativo? Ou a tecnologia está indo muito longe? Have you ever noticed that when you change your diet, your work rotine changes too? This is what scientists are discovering. There is evidence that restricting calories can have long-term health benefits, including improved mood and better quality of sleep. But tech workers in California have latched on to another positive side to the practice: they say that on the days that they are not eating, they get more done in the office. Do you think this is true? Read Peter Bowes' article for the BBC and tell us what you think. Is It Too Bad Talk to Strangers? Why it’s so hard to start a conversation with people that we don’t know? Have you ever though to say more than just ‘’hello”, “good morning”, “bye”. And for those that we don’t even say that? People who aren’t like you and who you don’t know exist for you only as categories. Abstractions. People who are different than you who you meet in physical space and talk with – not at – are individuals. The more we can have contact with people who aren’t like us, the more we are challenged, invited, required to see them as humans, as specific individuals with a context. Hate breeds on seeing people as categories and abstractions. Read more about this The Guardian’s article. Is The Technology Diminishing Us? Jonathan Safran Foer makes us reflect about the technology in our lifes. It’s a good thing that help us at work, home, to contact with our friends and familie, etc. But are we are getting more and more dependent of it? Is it possible to pay more attention in the world around us with so many technologies that are surround us? How Do You Manager Your Time? Do you know the MIT strategie? It’s an online productivity community of tackling your most important thing (MIT) first thing in the morning. My main issue with the MIT strategy is that it implicitly concedes that most of your day is out of your control. You better get that MIT done right away, it tells you, before the wave of messages, pings, posts and drop-bys drag you into a reactive frenzy. The more effective answer, however, is to reject the premise that your day must unfold reactively. Someone who plans every minute of their day, and every day of their week, is going to accomplish an order of magnitude more high-value work than someone who identifies only a single daily objective. (…) don’t settle for a workday in which only an hour or two is in your control. Fight for every last minute. Even if you don’t always win, you’ll end up better off. What are your priorities in the morning? How do you commute? We don’t mean what means of transportation do you use, we want to know if you like to chat with strangers while commuting. Are you a headphone user? Do you shield yourself from conversations while at the metro? We found a really interesting campaign done for the London subwaythat might make you think a bit more about this. 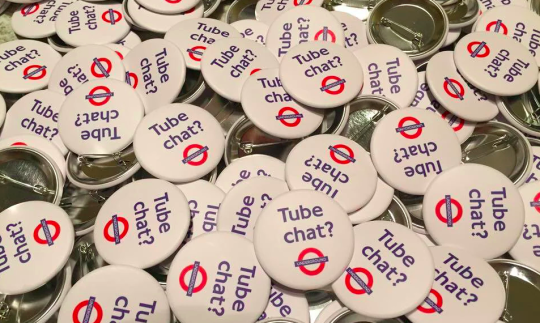 Badges emblazoned with the question “Tube chat?” have been distributed on the London Underground network. The London Metro explained they had nothing to do with the campaign. In the past they had similar initiatives for pregnant women and people with disabilities. On those two cases badges encourage people to give up their seats to a person who needs it most. Being offline doesn’t keep you safe, or protect you from anxiety, or make you a better person. If you have a mind that tends to spiral, and the internet enables that unrest, then while long walks without a phone will help, the phone itself is not to blame. Blaming social media for this “epidemic” is a way to conveniently ignore the more difficult solutions. There are ways to navigate and change the businesses that provide platforms on which many of us live, without condemning them forever. 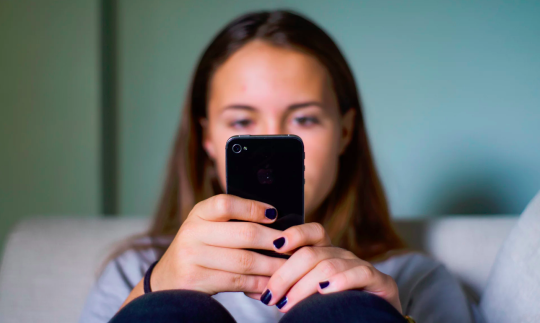 Is blaming technology an easy way out? Let us know in the comments. What are your experiences on the city you live? Are actions like this working? Would you like to see something like this near you? we wold like to hear from you in the comment section! What Are The Trends Of The Workspace? An article at Linkedin createted by Connie Chan shows 7 trends influencing workplace design and improtance of them. Workplace design has a major impact on the productivity and happiness of employees. In fact, research from Gensler, a worldwide design firm and aFOW Community speaker at the Future of Work Forum Boston, shows that poor workplace design costs U.S. companies about $330 billion per year in lost productivity. Nowadays it’s commom see workplaces with differents designs, instead of that “office” thing like white wall, office chairs, each employee with specific place to work, unable to change place with others, etc. Narcelio Grud, an urban artist from the Brazilian state of Ceará, decided to take action regarding the high death rate related to traffic on his home state. According to oficial numbers in 2015 2.620 deaths occurred due to traffic accidents. With this on mind the artist decided to give traffic lights a new ‘face’ in an attempt to get drivers attention. 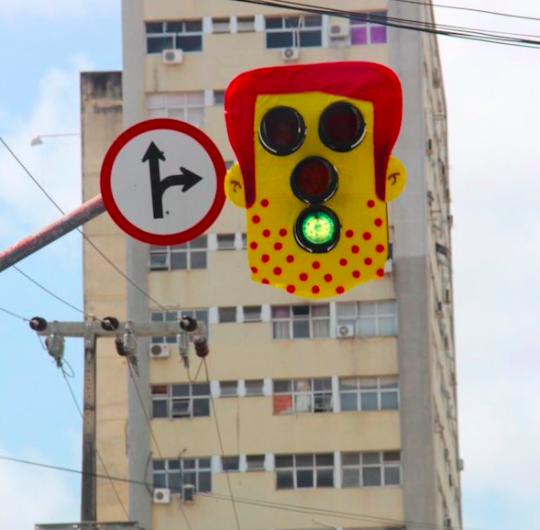 The artists transformed traffic lights with masks made out of fabric resembling pop culture characters like David Bowie, Bart Simpson, Batman, Banksy, amongst others. The state government released an official statement calling the action an act of vandalism. It’s rally interesting to see the point of friction of the artist disruption. He planned behavioural nudges to interrupt default daily behaviours. He modified the urban landscape to cause reflection. Do you think this kind of action can make a difference? What are your experiences in you home city? Would you like to see something like this on the traffic lights around your neighborhood? Do behaviourla nudges like this one help make a city safer? Let us know in the comments. Writing for Contagious the Head of Copy at R/GA London talks about her experience with mental heath disorders and how the ad industry deals with it. According to the author the industry is overtaken with the promised of connectedness. Yet her argument is that even tough we plan for a connected world we are not experiencing the connections. I wonder if, the more that we say the word ‘connected’, the harder it is to question. And the more that we’re literally digitally connected, telling stories designed for collective consumption (and likes), the more shadowy our quiet, vulnerable, messy, ugly internal worlds become. In spite of mindfulness apps aplenty, and the ever-expanding wellness industry, actual conversations about mental health in adland remain hushed. The closest we seem to get is talking about running, spinning, yoga, kale – the need to calm the mind sanctioned under the guise of self-care, but still unnamed. It’s hard to be honest in an environment like advertising. For the most part, it thrives on competition and awards. […] If we can start by naming our failures, by being honest, then perhaps the state of our mental health has more of a chance. If we aren’t able to name and talk about the pain we’re experiencing we can’t be supported to recover. Speaking openly is our best chance to address mental health, and more than this, it’s our collective responsibility. What is your experience while at work? Do you feel there could be an open conversation about mental health? If you work at an ad agency, are people interested in the subject? What about being connected, do you feel we are working toward a more understanding workplace? Let us know in the comments.